My breakup with eggnog happened in the 80's when we were all duped into believing that fat would make us fat by several studies put out by the sugar industry that has since been debunked as false. 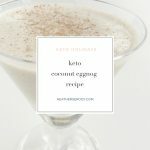 Now that I know how good fats are for my brain and my body, and how bad sugar is for my long-term health, I'm on a mission to transform my favorite recipes into keto-friendly ones that are sugar-free and full of the good fats that are part my whole-foods ketogenic way of eating. 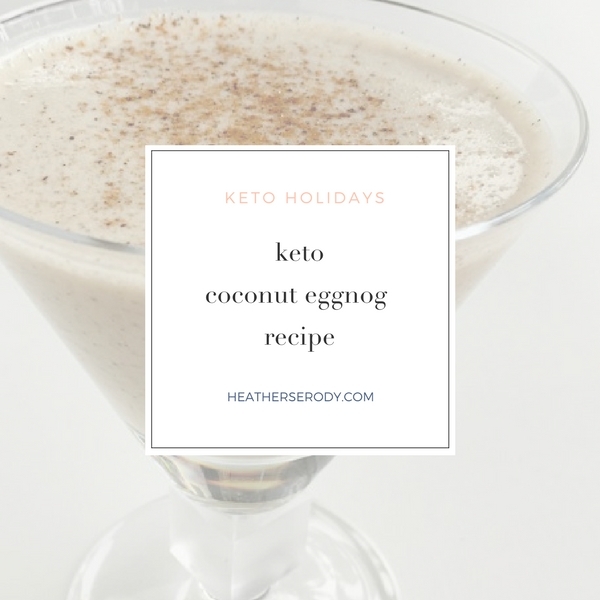 Making eggnog healthy-fat friendly, dairy-free, and sugar-free is so easy. I swapped the dairy with coconut fats, although you could totally use heavy cream, too. And I replaced the sugar with Swerve sweetener. 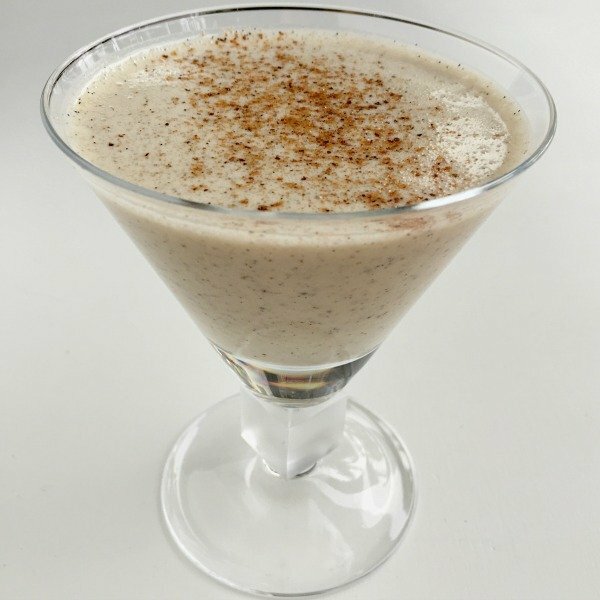 The swap transforms the traditionally heavy and super sweet eggnog recipe into something lighter and decidedly more delicate in flavor. The result gives a mild coconut flavor spiked with the creamy taste of vanilla, nutmeg, and cinnamon. I recommend and use Swerve sweetener for my recipes. Swerve is a sweetener made from erythritol, oligosaccharides and natural flavors. Studies on Erythritol in humans show that it does NOT cause digestive distress (1), and has been proven to be very safe for human consumption. Double-blind, randomized control trial studies confirm that irrespective of sweetness level, the consumption of erythritol does not significantly raise blood glucose or insulin levels after eating. (2) You can get Swerve at Whole Foods or Amazon. So, please don't be scared off by erythritol's scary-sounding name. Erythritol is your sweet friend. Swerve has less than 5 calories per teaspoon. If you are baking with Swerve it has 51 calories per cup and 5g carbs per teaspoon, but before you think that's too many carbs, please know that the body doesn’t metabolize these carbs, which is why it does not impact blood glucose or insulin levels, and that's why the nutrition information for this recipe does not reflect carbs from the Swerve. If you're going to make your coconut eggnog into a cocktail, I recommend Meyer's Dark Rum. Meyer's are coconut are a match made in heaven. I experimented with adding whipped egg whites and whipped cream and I just think this eggnog tastes best without extra cream. But don't forget to garnish your eggnog with a sprinkle of nutmeg – it makes all the difference. Adapted from The Best Eggnog Recipe In The World by Meredith Steele via Jamie Oliver. In a medium sized saucepan, combine coconut milk, cream, cinnamon sticks, vanilla bean powder, nutmeg, and 1/3 C of Swerve. Whisk well to combine. Bring to a light boil over a medium heat. Once bubbling, remove from heat and allow to cool and infuse for 30 minutes. In a large bowl or stand mixer, beat egg yolks and remaining 1/3 C Swerve for about 1 minute on high speed until shiny and thickened so that it sticks to the back of a spoon. After milk mixture has cooled somewhat, remove cinnamon sticks and then slowly add the yolk mixture to the milk mixture, whisking constantly until the mixture is combined and smooth. Refrigerate until ready to use - overnight or for up to 3 days. Serve eggnog over ice in a rocks glass or neat in a martini glass. Garnish with a sprinkle of grated nutmeg. If spiking eggnog, combine 1/2 C eggnog with 1/2 C ice and 1 shot of Meyer's Rum. Shake well. Serve in a rocks glass or strain into a martini glass & sprinkle with nutmeg.